It's Banned Books Week!! To bring attention to challenged and banned books, I will be publishing reviews throughout the week of books that have been at the top of the challenged lists many times. I hope you'll visit and read these reviews, and also share what your favorite banned or challenged books are in the comments below. Click here for the list of the most challenged books in 2013. Captain Underpants tops the list once again! And now on to my regular weekly update. I read The Absolutely True Diary of a Part-Time Indian by Sherman Alexie, which I will be reviewing for Banned Books Week. Now I'm reading Accidents of Marriage: A Novel by Randy Susan Meyers for a book tour on Tuesday. C is reading Loser by Jerry Spinelli in school, and he seems to like it. M is reading Diary of a Wimpy Kid, Book 1 by Jeff Kinney. My sons loved Captain Underpants. I will look to see if they are still here or if they took them when they moved out. I loved The Absolutely True Diary of a Part-Time Indian. My son loved all of the Captain Underpants books. My daughter hasn't discovered them yet! Have a great week! Sherman's book is a great one! Looking forward to your thoughts on the Myers book. Thanks. I'm still reading it! I need to get through it tonight so I can get that review published tomorrow!!! Looking forward to your Banned Books reviews... and The Missing Place sounds like a great read as well. 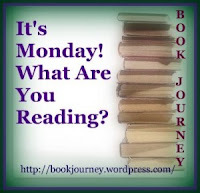 Have a great week Julie and happy reading! Thanks! Have a great week and thanks for stopping by!! I love Diary of a Wimpy Kid and I have heard good things about The Absolutely True Story of a Part time Indian. Have a great reading week! I have to admit I like Diary of a Wimpy Kid too! Have a great week! Oh, Diary of a Wimpy Kid! I hope you enjoyed that book - and the others too, of course. Have fun reading this week. I can't keep the Captain Underpants books on the shelf in my elementary media center. The kids just love them. I have been meaning to read the Sherman Alexie book for years but it keeps slipping farther and farther down the list as new books come in. Happy reading! I recommend you get around to reading the Alexie book. I have been considering it for years during Banned Books Week and never got around to it until now. My boys never liked the Wimpy Kid books that much - they thought the main character was kind of mean to his best friend...which I thought was sweet of them! My younger son loved Captain Underpants, though! BTW, I love your new banner photo - some great books lined up there and I like the look of the photo. Thank you! I would love to someday get a graphic designer to design a banner for me (and a logo) but for now, I'll settle for a picture of my bookshelf. Just three on there that I still need to read. Of course, I have several other shelves with plenty more books to read!! So, did you take the picture yourself? And how did you give it that old-fashioned look? I have been wanting to add a book photo to my blog for a while. I do like a clean look, but it;s sort of impersonal now. Oh, and what site did you use to create the banner with your blog title? I am such a neophyte at all this! I did make a custom button for my Big Book Summer challenge but that was a while ago. Sorry to pester you with so many questions! I did take the picture myself. That's one of my many bookshelves. I took it with my iPhone and used some sort of filter on it (I'm sorry I have no idea which one!!). Then I put it on my computer and opened it in a program called SnagIt. It's a photo editor. That's where I used the eye dropper to get the orange color from one of the books, and typed the name of the blog using that color. I just saved the image from there and uploaded it to Blogger. Pretty unprofessional, but I like how it came out. Haven't read Loser yet but I do love Jerry Spinelli. He seems to like it. I don't think I've read anything by him yet. Banned books always surprise me....it just seems like books shouldn't be censored! I completely agree. Have a good week! I need to read The Absolutely True Diary. I always think I own it but I don't; I always get it confused with The Disreputable History of Frankie Landau-Banks. I guess it's that long title. Enjoy your week! Ha! Well, I do recommend it if you end up getting it at some point! Have a great week! I have accidents of marriage on my TBR. I want to read the Sherman Alexie book at some point--have heard great things. Accidents of Marriage was pretty good. My review is on the blog now. I hope you're having a good week.